PEARL DIVER (D. Trimmer) Tet. ((Ballerina On Ice X Tetra Ruffled Masterpiece) X Great Blue Heron)) 35” 5 3/4” EE Re. Ev. 24 buds. 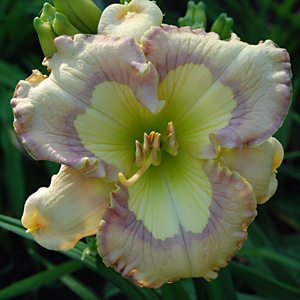 Cultivars that extend the season, either on the early or late season are important, especially in parts of the country were rebloom is limited. PEARL DIVER opens our season with a bloom of pale abalone pink above a subtle eye of blue lavender sitting outside a large appliqué pearlescent chartreuse throat.